That's what I thought, when I saw the ceiling of a Dining Room that is being painted for me this week. The shade of blue is a mix of Benjamin Moore's 'White Rain' with a small percentage of White Dove added to lighten it up. My painter is so understanding of the need to mix colors to get the exact shade I am looking for. However, it is my client who is open to suggestions from her designer - and that's a great mix when you want to make a room come to life! When you look at the ceiling it's like getting a breath of fresh air! Photo courtesy of Blumotion Inc. Simple yet attractive in design, ease of use, good looks: these are all the components of kitchen and bath hardware that need to be addressed with today's busy lifestyles. Full-extension drawers provide more space and easier to access space. 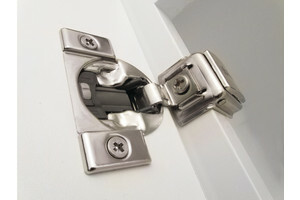 Hardware may be last of the list of a Kitchen or Bath renovator. But it should be a top priority if you want to enjoy your renovation for years to come.